I popped into the Bluecoat this afternoon to see the exhibition marking the centenary of Malcolm Lowry’s birth, Under the Volcano, which is in its last few days. I was glad I did – it’s an enormously interesting exhibition, featuring paintings inspired by Lowry’s work as well as memorabilia from Lowry’s Wirral and Liverpool upbringing collated by Colin Dilnot. Malcolm Lowry (1909-57) was inspired by the Wirral of his childhood. His Merseyside youth informs his writing, and Liverpool, which he described as ‘that terrible city whose main street is the ocean’, continued to hold tremendous significance for him. 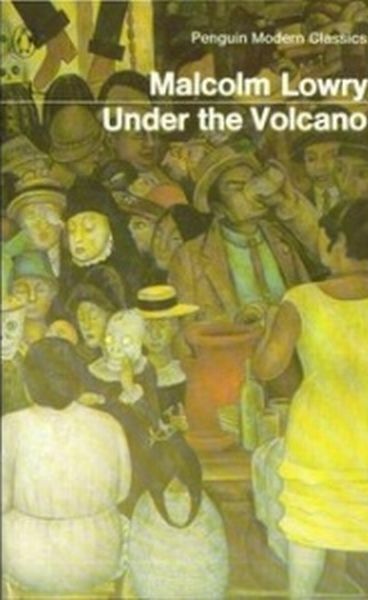 Under The Volcano (1947) is considered one of the most poignant, poetic and significant novels of the last century. Set in Mexico on the Day Of The Dead, the novel’s tragic resonance and insights into the struggle for creative expression have inspired many artists as well as writers. I read it decades ago – as a student – and only have a vague memory of the atmospherics – carnival noise in the streets and dark, alcohol stupefied interiors. This exhibition has encouraged me to read it again. The exhibition focusses on Lowry’s Merseyside origins and his international dimension. It reflects his continuing influence on artists across the creative spectrum – painters, filmmakers, choreographers and musicians, as well as writers and historians. I was impressed particularly with three impressive paintings by Edward Burra , a series by Julian Cooper and work by Adrian Henri. Edward Burra (1905-1976) occupies a particular place in 20th century British art: represented in major collections yet remaining, like Malcolm Lowry, something of an outsider. He is best known for his satirical, often macabre paintings of 1920s and 1930s urban life, particularly its seedier side. He flirted with Surrealism and his allegorical works share some of its characteristics. Working mainly in watercolour, he imbued his art with ‘a feeling of tawdriness and the meretricious and yet, at the same time, (created) such convincing beauty’ (George Melly). Despite constant ill health, Burra traveled widely, visiting Lowry in Cuernavaca in 1937, together with Lowry’s early mentor and their mutual friend, the American writer Conrad Aiken. On his return to England Surra painted Mexican Church, its composition based on two postcards of churches he’d visited, the cathedral at Taxco and Santa Catarina, Mexico City. Burra and Lowry did not get on, however both shared an interest in Mexican culture. Burra was influenced particularly by the Mexican muralists and the prints of Jose Guadalupe Posada (1851-1913), whose depictions of lively skeletons had a profound effect, contributing to his interest in representations of death. Under the Volcano’s Day of the Dead theme is echoed in Burra’s other two paintings shown here. Dancing Skeletons, painted after a visit to Spain, anticipates his Mexican journey and immersion in the iconography of death. In Skeleton Party, completed nearly 20 years later, Surra returns to this earlier theme. Whilst the pyramid shapes on the horizon have been identified as slag heaps in an industrial landscape, they could equally suggest the twin peaks of Lowry’s Mexican volcanoes. I love Edward Burra’s Harlem paintings. There’s a good selection of his paintings, including some of those, here. Douglas Day’s biography of Lowry in particular, linking the writer’s life to his fiction, provided Cooper with a ‘layering of myth and reality. .. I see the novel now as quite prophetic in the way that its leading metaphor applies as much to an “economic growth” as to an alcohol addiction’. Like Lowry’s writing, the paintings are meticulously detailed and create a real sense of place and time, an evocation of Mexico and the book’s setting. Each takes a particular episode from the book chosen for its self-sufficiency and symbolic power. They avoid being simply illustrative however, the structure and execution of the paintings echoing the complex layering of meaning found in Lowry’s masterpiece. Despite the specific references, the paintings are autonomous, requiring no prior knowledge of the book. In his series of paintings and drawings, Adrian Henri (1932-2000) sets the Mexican Day of the Dead in contemporary Liverpool, populating Hope Street with a crowd including artists and writers William Burroughs, Alien Ginsberg, Frida Kahlo, Ed Kienholz and Henri’s Liverpool painter friend, Sam Walsh. In the main painting shown here the white suited, pipe-smoking figure on the far left is Malcolm Lowry. There are other echoes, of a visit Henri made to a graveyard in Lorraine on the Day of the Toussaint (All Saints’ Day in France, when people take flowers to the graves of dead friends or relatives), and of the eerie and sinister masks at the Basle Carnival. For Cisco Jimenez, a native of Cuernavaca where Under the Volcano is set, Lowry’s book and his life continue to provide – 70 years after he stayed there – a barometer for measuring the expectations and failures of this Mexican town. For Jimenez the paradox portrayed in the novel repeats: the clash of the popular against the contemporary, tradition under threat from global changes and impositions, and the failure of utopianism (colonial utopias, the social experiments of the 1960s, the neoliberal policies in the 1990s). Jimenez’s mixed media sculptures make playful reference to Lowry’s life: his drinking (Two Atoms Connected), golfing prowess (Necklace), and in Peddler the imagery and folkloric aspects of Under the Volcano, whilst AK47 Barroca is indicative of the artist’s concern with the contradictions and violence of the everyday in Mexico. ‘Cuemavaca is no longer what it used to be. What remains are tourism and opportunistic “cliches” of the quiet and colonial past – multiple thematic hotels and restaurants for wealthy foreigners and visitors from Mexico City, and real estate speculation. Nature has been covered over with tons of concrete, and the last old mansions with their majestic gardens are slowly falling down, giving way to massive condominiums (which we call “condemoniums”). You face such disaster every day’. 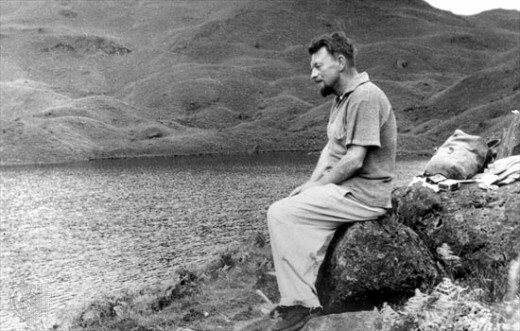 Malcolm Bradbury described Malcolm Lowry as having a “curious internationalism”. That is what has perhaps led him to be less well known in his home city than he might have been, and is also what the Bluecoat has attempted to reflect in this new exhibition marking the centenary of his birth. Those who do know of Lowry will probably have read his magnum opus, Under The Volcano. But few will be aware that the author of what has been described as one of the greatest novels of the 20th century was born the son of a Liverpool cotton broker in New Brighton. In fact, there are many intriguing aspects to the man who was a writer, golfer, nomadic adventurer and inveterate drinker (alcohol caused his death at 47). The Bluecoat’s two-month celebration of all things Lowry includes the publication of a new book, From The Mersey To The World, the screening of John Huston’s film Under The Volcano starring Albert Finney, and music written by poet Ian McMillan. At its heart, however, is this exhibition of artwork and film inspired by the writer and covering not simply his life in the Mexican town of Cuernavaca (where the novel is set on the Mexican Day of the Dead), but also his fascination with the Isle of Man, his time in New York and his spartan existence in Canada. It turns out to be perhaps one of the most satisfying exhibitions held recently at the Bluecoat, mostly because while it features disparate artists, it has a pleasingly unified central theme – they all share a fascination with Lowry. Adrian Henri’s vibrant Day Of The Dead In Liverpool paintings sit alongside works from Julian Cooper’s Under The Volcano series, Cooper’s images redolent of Hockney or Hopper. 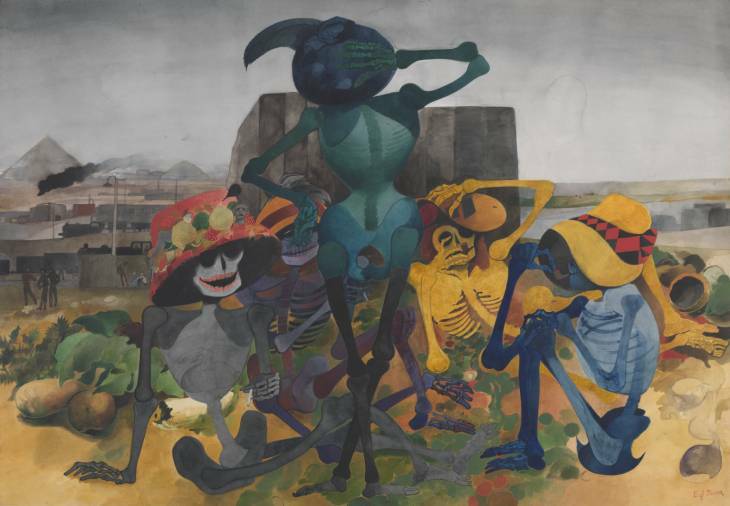 There are also a series of intricate Under The Volcano-themed prints by Chilean artist Jorge Martinez Garcia, while the Tate has loaned the gallery watercolours by Lowry contemporary Edward Burra which (despite his apparently disliking Lowry) also feature the skeletons so prevalent in day of the dead iconography. And, most fascinatingly of all, there are never-before-seen telegrams, borrowed from Liverpool Record Office, charting the highs and lows of the globetrotting writer’s hectic life.